I really loved this story. 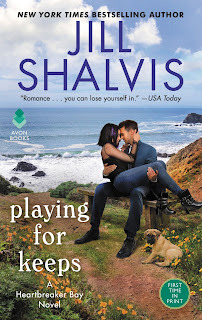 Among all the books of Jill Shalvis's career, I think it stands out as one of her best with Sadie and Caleb as one of my favorite Shalvis couples. Talk about your complex characters. As their back stories began to unfold, revealing the events that have brought them to this point in their lives, I wanted to hug them both and then cheer for how far they've come. Sadie's story just about broke my heart. 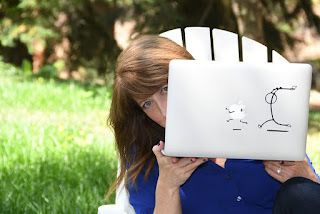 As it unfolded, it was easy to see why she was prickly and determined to keep her past a secret, why she was so certain revealing her true self would deem her unlovable. Caleb, of course, is much more than his appearance would suggest as well, as Sadie comes to discover. I adored him for his tenderness, patience, and staunch support of Sadie, even though he does hit a few potholes along the way. It's a rocky road to a happy ending for these two but oh, so worth it in the end. Shalvis surrounds Sadie and Caleb with an eclectic group of secondary characters who bring an added richness to the story. Leading the pack, of course, is Lollipop, the three-legged stray dog Sadie and Caleb co-rescue. I fell just as hard for this adorable pup as they did. Joining Lollipop are the heart-of-gold motorcycle club guys at the tattoo shop where Sadie works, Ivy, the taco truck owner who gives Sadie insight into the fact that Caleb is much more than the appearance he projects with his perfect, high-dollar suits, Caleb's overprotective, if well-intentioned, mother and sisters, Sadie's misguided and dismissive family, and Naoki, an important character in Caleb's life whose contributions to this story are endearingly poignant. They all come together to create a heart-tugging, emotional, romantic journey that is going straight to my keeper shelf. If you enjoy character-driven contemporary romance with emotional depth, humor, charm, complex issues, and hard-won happy endings, I highly recommend Playing for Keeps. This book is not only going straight to my keeper shelf, it's also going to my Best of 2019 watch list. Don't let the fact that this is the 7th book in a series scare you off. While a few previously introduced characters make appearances, this book stands on its own. Have you been reading the books in the Heartbreaker Bay series? Do you enjoy animals in your romances? Do you enjoy books where characters have to overcome significant emotional hurdles to achieve their happily ever after? Animals in romances add greatly to the story and the warmth. I look for books which are meaningful and individuals who have to deal with emotional obstacles always interest me greatly. Love Jill's books!!!! And her animals are always great in her books!! I always like animals in a story. I haven't read this series. I've read a few of Jill Shalvis' books and enjoyed them, but I need to read more of her stories. I enjoy Jill's books and am up-to-date on the Heartbreaker Bay books. I love animals in books, as in real life. Thanks for the post and giveaway. Since I enjoy Jill's series having animals in a book would be even more appealing since I am an animal lover. Animals are my comfort and hope. I always like animals in a story and Jill's books are always so funny. Have you been reading the books in the Heartbreaker Bay series? Yes, I like any book Jill writes. I recently read HOT WINTER NIGHTS and ACCIDENTALLY ON PURPOSE. Yes, animals are OK. I read Candis Terry's TRULY SWEET book with Hank, a rescue dog, who really helped his owner, Jake Wilder deal with mental issues post war. Do you enjoy books where characters have to overcome significant emotional hurdles to achieve their happily ever after? Yes Truly Sweet was an example Also Rainy Day Friends (death) and Second Chance Summer (cancer) by Jill Shalvis. I enjoy Ms Salvis' books very much. And yes, animals add to a story for me. I have lived with animals all my life so it is common sense that people who are characters in books would have animals in their lives. I think in life most of us must overcome emotional ups and downs so finding that in a book makes perfect sense. I live animals. So of course if you add to the animal if makes me love it even more. Animals in books tells me what kind of person they are. I loved Chasing Christmas and Sweet Little Lies. This sounds like a good one, PJ. I haven't started the Heartbreaker Bay series yet, but I like that it can stand alone. I love when the H/h have emotional pasts and I love animals in my books, especially dogs! Looks like I have to check this one out! Wow. 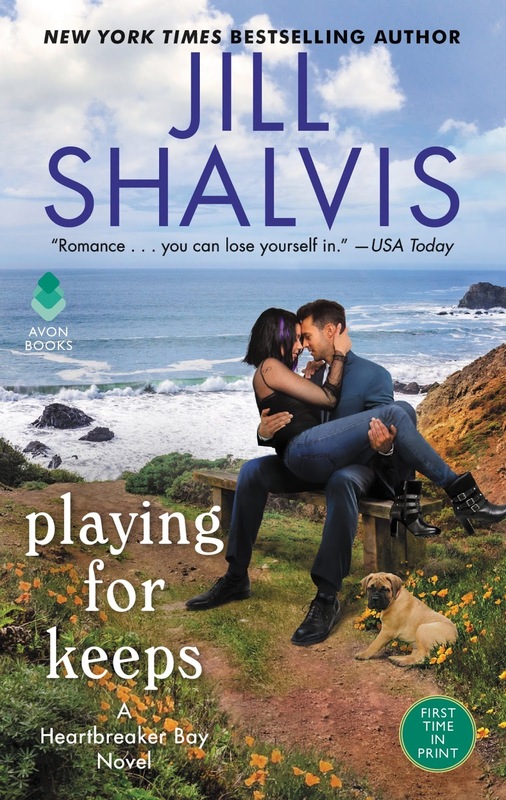 I've only read one Jill Shalvis book, and that was years ago, but your review has me itching to read this one. Going to have to add it to my sky-high TBR mountain. Thanks, PJ! I've been reading each of the Heartbreaker Bay books as they've come out. This one is really good. I like how both the characters have backgrounds to overcome and the pup is adorable! I have read several excerpts from this book and it is certainly engaging. I have only read one of Jill's books and have several in my TBR Mountain. PLAYING FOR KEEPS sounds like one I will enjoy. Each character is has a strong impression of just who the other is and both have a lot to learn. They have both developed strong images of ho they are to protect their vulnerabilities. I think animals are an asset to a story. They tend to bring out the real personality and heart of the characters. Yes to all the questions. I love Jill's books. I love Jill's books & get sense of humor. Yes, animals in stories add a lot I think. I've read one book in the series. I do love pets in a book. I haven't read any of the Heartbreaker Bay series. Really enjoy reading books with animals in the stories. They can certainly add a humorous element. Sometimes I crave something lighter hearted and sometimes I crave a more emotional read. Depends on my mood.